Do you think you’d be more likely to buy a new MMO if it came with a 28 day trial vs. a 4 week trial? Would you be happier if your game character got a new ability with a 1.5 minute cooldown or a 90 second cooldown? Would you feel more pressure from a 5 minute countdown timer or a 300 second timer? Would you be happier with new loot that improved your armor rating of 10,000 by 10% or loot that improved it by 1,000? In the article, the authors propose what they call a “unit effect,” which basically says that people often don’t pay attention to the unit in which a figure is presented, and can thus be overly influenced by the magnitude of numbers when comparing options. They found, for example, that subjects tended to see a smaller difference between warranties lasting 7 and 9 years, than between warranties lasting 84 and 108 months. This despite the fact that the differences between warranty length is identical in either case — 7 years is the same as 84 months and 9 years equals 108 months. Relax, Chuck. You still have 1,038,575 seconds before the military arrives. In a follow-up study, the researchers manipulated the presentation of energy content in apples and candy by presenting the numbers in either kilocalories or kilojoules (1 kilocalorie = 4.184 kilojoules, so the latter unit resulted in bigger numbers). They found that presenting in kilojoules (i.e., with a bigger number) caused people to choose the apples more often if they were concerned about watching their calorie intake. The point is that people often don’t do the mental arithmetic needed to compare two different units. Instead they slide down the easier path of just comparing numbers and using mental shortcuts like “Bigger numbers are better” (or worse, depending on the context). Long-time readers of this blog will recognize “Screw it, I’ll just take the path of least resistance because I’ve got too much going on” as one of our brains’ most common refrains. What’s more, comparisons between two factors are exaggerated when the numbers involved are bigger. This has a number of interesting applications to game design and how we as players react to things. As I hinted at above, when it comes time to choose new abilities for your character, cooldown timers should be seen as more attractive if they are presented in minutes rather than seconds. Free trials should be expressed in days (if not hours) instead of weeks or a month. 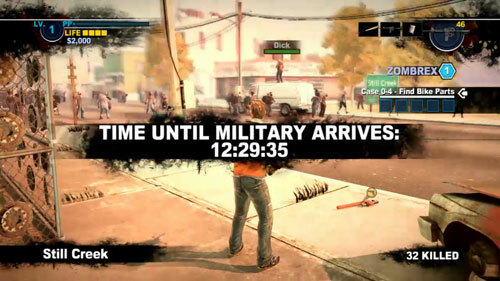 Or the countdown to the military’s arrival in Dead Rising 2 could seem longer if it were just shown in minutes. Or consider this: if your game uses numbers to represent damage, having really big numbers that differentiate between weapons is going to greatly affect players’ choices. Say an in-game vendor is selling an axe that does 600 points of damage and a sword that does 1,200 points of damage. If the unit effect is true, players are going to see the sword as worth more than twice as much gold as they would if they were comparing options that did 60 and 120 points of damage. Because the magnitude of the numbers will inflate the quality difference between the two. This might not only affect selling prices from NPCs, but also auction houses as well. Now let’s consider game reviews. Say you’re looking at review scores for different games and trying to decide which to buy. The unit effect described above would suggest that review scores on a 100-point scale would be more likely to increase perceptions of quality differences between the two games than would scores on a 10-point or 5-point scale, even if the math is the same. Man, brains can be a real pain sometimes. 1. Which, I think, should be ALL of you. 2. Pandelaere, M., Briers, B., & Lembregts, C. (2011). How to make a 29% increase look bigger: The unit effect in option comparisons. Journal of Consumer Research, 38. 3. Thanks to reader and my personal friend Frank for bringing news reports of this research to my attention, and to Mario Pendelaere, the first author on the article who graciously sent me an advance copy of the paper so I could read the original source for myself. This is a great explanation why modern pinball game scores are in the millions to billions. Loot that increases *base stat* by *percentage* will be of more value when *base stat* increases versus loot that increases *base stat* by *fixed amount*. If we have a game with cooldown reducing effects (on ability leveling up for example), we have implied a level of granularity (1/10th of a minute or 6 seconds versus 1 second) so with a a 1.5 minute cooldown, you would expect your next cooldown reduction to take it to at most 1.4 minutes whereas potentially in the 90 second case you could see that going to 89 seconds. One is preferable to the other. The 10% armor example was kind of contrived for the sake of illustration, I admit. But if you were making a choice at one point in time, I think the unit effect could still happen. For the cooldown timer, I’m not sure I’m following your comment. I was thinking of an ability that had an instant effect. You cast fireball. You can’t cast fireball again for 90 seconds [1.5 minutes]. Right. The idea is that if your fireball can be leveled up, perhaps the cooldown decreases as a result of leveling it up. If the cooldown is described as 1.5 minutes, the implied minimum it can decrease by is .1 minutes (6 seconds), whereas if the cooldown is described as 90 seconds, the implied minimum it can decrease by is 1 second. Ah, I see. That’s reading a bit more into it than I intended. But every outcome has multiple causes, so there’s nothing to say that both aren’t happening. Me too! I’ve asked a couple of other people about this too, and everyone agreed that 90 seconds sounds faster than 1.5 minutes. So there’s definitely something going on here with our perception of numbers, but it’s not as simple as this article makes out. Sometimes the numeric values can overshadow the units, but other times the units can overshadow the numbers. I suspect part of the difference is that nobody knows what the hell a calorie or joule means, but we’re very familiar with seconds and minutes. It does seem like there’s more room for research and development of this theory. There may be some units (seconds vs. minutes, days vs weeks) that are so easy to switch between that the effect is diminished or gone. But trying to convert between unfamiliar units (think spending money in a foreign currency or the kilocalories and joules) would make it much more pronounced. I’d be interested to see how much that kind of thing moderates the effect. Someone get on that! The thing I find most interesting is how larger units widen our perception of differences between two options, even when the unit is easily understood or completely arbitrary. That seems pretty robust from reading the original study. Interesting, I’ve been using this concept for a few years now because, well, “People like good numbers to be bigger and bad numbers to be smaller” is roughly how I tend to put it. So you’re not scoring 10 or 100 points, it’s no less than 1000, and such like that. I’m actually really surprised that no one wrote something about this in a journal previously. This is something already pretty widely known by game companies, even if just in the marketing department. From what I’ve seen on prices for XBox Live, it seems they could chop a 0 off entirely. Some older games were also really aware of this. Yu-gi-oh (as an example we’ll all chuckle at) uses numbers orders larger than are needed. They have numbers like 3000, but the lowest level of granularity they use is a single unit of 50 (last I saw). They could effectively change it to 1-60 instead of 50-3000 and be mechanically the same, but instead they go with the Really Big Numbers. I agree with the above posters. Just before this article popped up, I was toying with my gui design: Would the player prefer 2 mins and 30 secs of treasure hunting time, or 150 secs of treasure hunting time? My gut reaction tallied with the responses from all I asked: 2 mins and 30 secs feels like more time. The consensus seemed to be, as Juv3nal alludes to, that the minute value is regarded as a buffer – that is, it does not tick down as quickly as seconds, and appears to be assigned more value than those disposable seconds. Perhaps we need to consider the (immediately) perceived rate of change in a value?